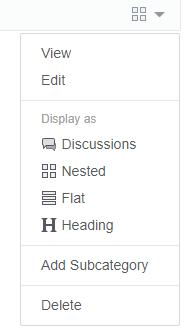 Discussion Is Create Category dropdown menu supposed to include option to set custom permissions? Is Create Category dropdown menu supposed to include option to set custom permissions? I haven't used Vanilla in several years and am pleased by its growth and continued vibrant support community. Thanks to all responsible for that! I have installed 2.6.4, and seem to recall that I had no trouble before in setting up private rooms visible only to certain roles, but the process must have changed. I can create the role and category, but see no way to marry them. I searched extensively before asking, but find no current info here that corresponds with what I'm seeing when I create the category. Can someone tell me how to assign a role to it? When you edit a category, you have to check "This category has custom permissions." Afterwards you can give custom permissions when editing a role. 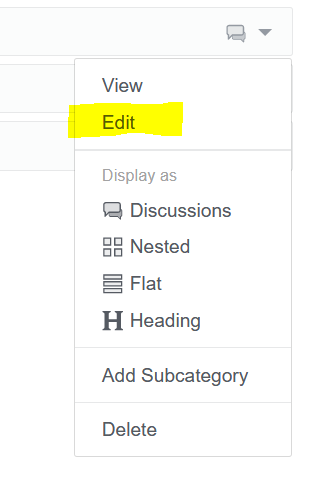 Once the category is created, click the button on the right of the category, then choose edit. Then custom permissions option is at the bottom. Oh, duh, of course. Thank you so much.